WINB transmits from the town of Red Lion in Southeastern Pennsylvania. Our main transmitter is a Continental 417B designed and built in Dallas, Texas. It has a rated maximum output power of 50kW. A new DRM transmitter, an ASI CE-50000WS, was installed in April 2018 and is in program test at random times. The transmitter is rated at 15 kW and is using the Rhombic antenna at 062 degrees. The authorized schedule for this transmitter is: Monday-Friday 0700-0900 on 7325 kHz, 0900-1100 on 9265 kHz, 1100-1700 UTC on 15670 kHz. At times when the ASI transmitter is not being tested, WINB will occasionally test in DRM using its existing Continental 417B transmitter on 9265 kHz beamed 242 degrees. Programming on the DRM is from WINB's Internet audio stream and is in English and Spanish. The WINB transmitters feed a Rhombic antenna via an open wire feed lines. The antenna is 640 feet long and 110 feet above the average terrain. The principal radiation direction is 242 degrees true, or almost due southwest. Minor lobes exist to each side of the main lobe and to the rear on a bearing of 062 degrees true. The pattern when the antenna is fed in the 062 direction is the same as 242 rotated 180 degrees. 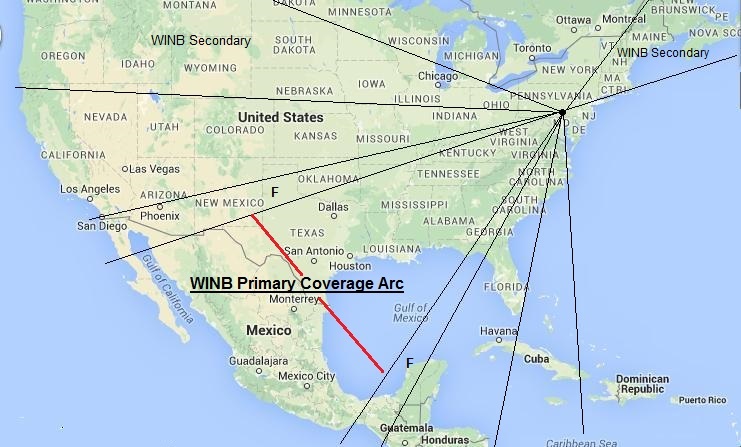 The primary coverage arc is for signal levels above 40% of main beam maximum field, which occurs in the main beam direction. The areas marked secondary to the south and northwest are side lobes with fields about 20% of the main beam maximum. The area marked secondary to the northeast of the station is the rear lobe at fields just below the other side lobes. At the long range, the main beam hits Eastern Australia and New Zealand. The rear lobe hits the Mediterranean area of Eastern Europe.